So sorry for the looooonng lapse in any posts or updates. After a tumultuous year of 2 moves, we are finally settled into a long-term place. I now actually have all our homeschool boxes unpacked, and a cute little homeschool area set up. I hope to update much more frequently now that we have a solid routine and much less upheaval. Rosie's Walk by Pat Hutchins is a favorite at our house. 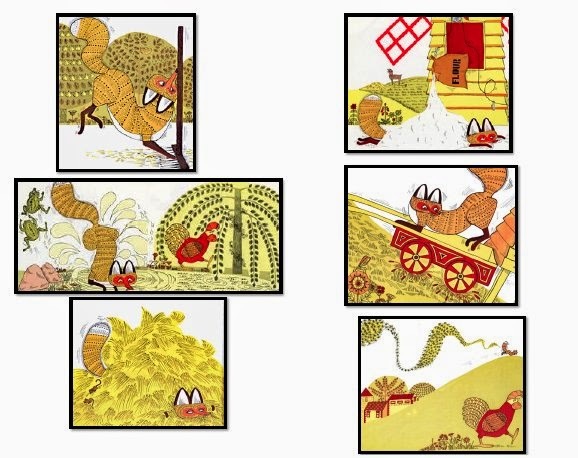 The simple text and delightful illustrations tell a story of an innocent hen outsmarting a hungry fox. My kids giggle each time the fox is snared. Recently we spent a week using Rosie's Walk to learn about ordinal numbers and prepositions. 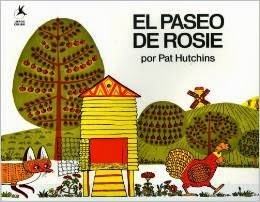 Most large public libraries carry El paseo de Rosie, and it is also available through Amazon for under $8. 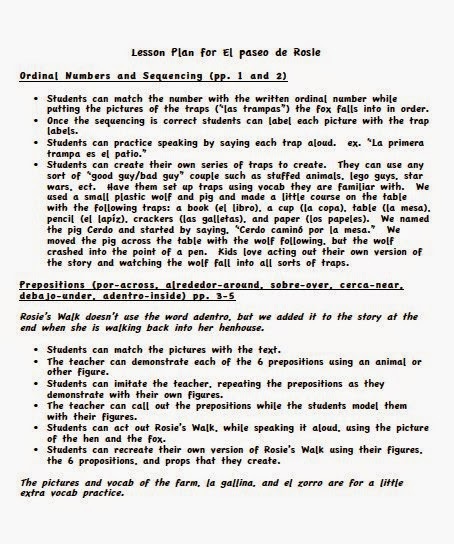 Click on the image to the left to access the lesson plan instructions. Click on the image to the right to access the pictures/text to complete the lesson. 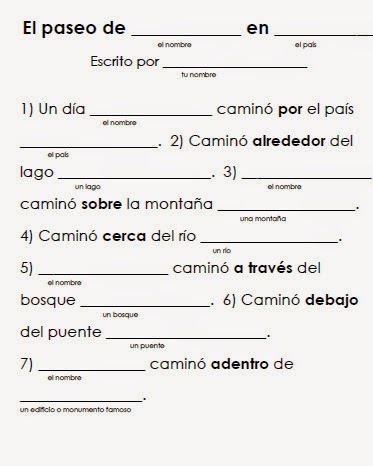 The lower image is a link to a book template for students to create their own Paseo de Rosie story. Once we finished all the Rosie's Walk activities, I planned one last enrichment activity. 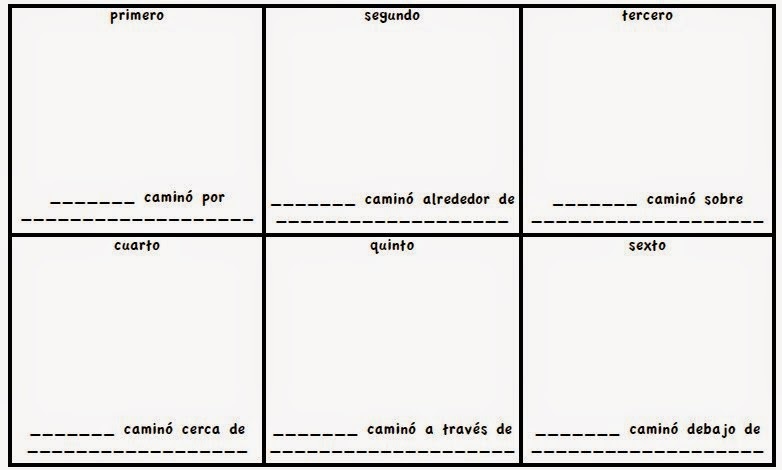 For this activity, I had both kids choose a country and create a Rosie's Walk-type story to write about their country. One son chose Russia (Rusia), the other Brazil (Brasil). Next they looked online for places (river, forest, monument, bridge, lake, etc) in their chosen countries to fill in the story template linked below. Once they had their story template filled in, I printed out blank maps of their chosen countries. They drew the places from their story template on the maps. Then they proudly read their stories to dad, acting out the prepositions on their maps (ex. drawing their finger in a circle alrededor del lago). Not only did they get one last experience with these prepositions, they also learned about some cool places and how to say them in Spanish.